A complete palm-sized personal rest room system for women. 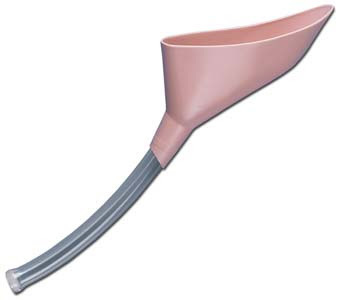 Convenient, easy to use funnel is great for traveling or when unsanitary conditions are present. Fits discreetly into storage pouch for travel or backpacking. So ladies, we finally have the opportunity to pee like men. I've always said how nice I think it would be to have the ability to pee standing up. Now, I was a Girl Scout and can squat like a champ, but I may just have to buy this thing anyway. And bonus: it's pink. Wow. Now THAT'S something to be greeted with when the page opens! When checking out their website, did you notice the gas powered blender? Camping & margaritas! Leave your funnel behind. You can pee 3 feet without any device: www.stand2pee.com - It does work.